When you are working hard in the gym you want to see results fast. The only way you’ll do this is by working hard on your diet too. 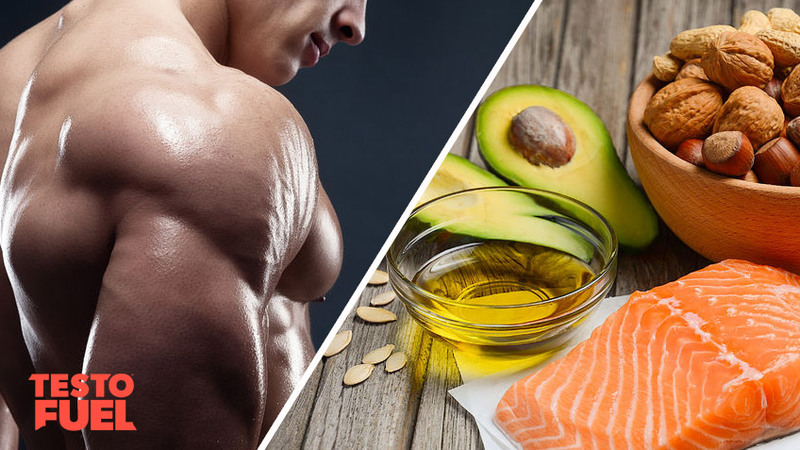 But with so much information out there on nutrition and testosterone its difficult to know the best approach – in this article we break down the reasons why you need fat in your diet, and why it’s essential to high testosterone levels. Cholesterol and testosterone – which type is best? We’ll not go too deep into the science here but to appreciate the importance of fats in the diet you really need to understand how they work and what they do – then we’ll look at how they control testosterone production. Saturated: (SFA) this is found mostly in animal products, but also in some plant products such as coconut and avocado too- it is solid at room temperature. Monounsaturated: (MUFA) this type of fat can be found in nuts, olives and seeds such as pumpkin and sesame. They are liquid at room temperature so are classed as unsaturated. Hydrogenated: Often referred to as ‘trans fats’. This is where manufacturers take a relatively cheap unsaturated oil and pump hydrogen in to it under high pressure to make it solid. You’ll find this type of fat in cakes, sweet products like biscuits and ready meals but you’ll also find some naturally occurring in ruminant animals such as lamb and goat. Cholesterol: The main two types of cholesterol are low-density lipoproteins (LDL) and high density lipoproteins (HDL) – both of these lipoproteins help transport cholesterol in the blood. You’ll find cholesterol in all animal products, particularly eggs, organ meat and shellfish. Key Point: The type of fat is ultimately down to the type of fatty acid-triglyceride chain length and the number and configuration of bonds between carbon and hydrogen molecules- the more hydrogen in the fat, the more solid it is. Fats are needed for a few different reasons- energy, temperature regulation and protection of internal organs for example. Fats are also important for hormone production and regulation. As Testosterone is the fundamental steroidal hormone, it makes sense then that it is synthesized via fats. In particular cholesterol which is classed as a ‘sterol’ making it a precursor for steroid hormone production. The research that is out there suggests that diets with less than 20% fats can inhibit testosterone production, particularly when compared to diets of around 40% fats . There are a number of studies showing the importance of high fat diets when boosting testosterone levels. For example, a study by Volek et al  investigated the effects of different nutrient factors against their effects on pre-exercise T levels and found that a diet high in SFA amd MUFA had significantly higher T levels. Interestingly the study also reported that high levels of protein decreased testosterone – and high PUFA intake did the same. Likewise, a study by Wang et al. investigated the hypothesis that reducing dietary fat in middle aged men would decrease male hormone metabolism. They reported that when volunteers were given a low fat diet, T levels showed a ‘downward trend’ where they fell by 12%. They reported that in the high fat diet group, T levels were 13% higher– and importantly their estradiol levels – a form of estrogen that can decrease testosterone- was 12-28% lower. So it appears pretty conclusive that in order to increase T levels you need a decent amount of cholesterol in your diet. Key Point: Diets of less than 20% fat decrease testosterone production. LDLs are often lumped with the title of ‘bad’ cholesterol as higher levels of circulating blood cholesterol and heart disease, and HDLs are often referred to as ‘good’ cholesterol due to their ability to clear LDLs from the blood. Whilst that debate is best left for another article, what is clear is that higher HDL levels are what you want to achieve if you want to boost your T levels. Some studies have looked at specifically HDL cholesterol, reporting that testosterone is positively associated with HDL intake, suggesting that the dominant effect of testosterone may be to increase HDL intake. This is particularly useful in type 2 diabetics . According to the Atwater system, every gram of fats, regardless of type, will give you 9kcals/37kJ . That makes it the most energy dense nutrient available (closely followed by alcohol at 7kcal/g). Body fat tissue is a moderator of your T levels and also estrogen, with high body fat allowing an enzyme called aromatase to irreversibly convert testosterone into estradiol– a type of estrogen. This results in decreased the male hormone and elevated estrogen levels. Essentially as you gain body fat your testosterone decreases – so it’s important not to over consume fats in case your weight starts to creep up. A good trade off would be to reduce the calories you get from processed sugar rich foods, so that you have a bit more room to increase dietary fat in your diet. 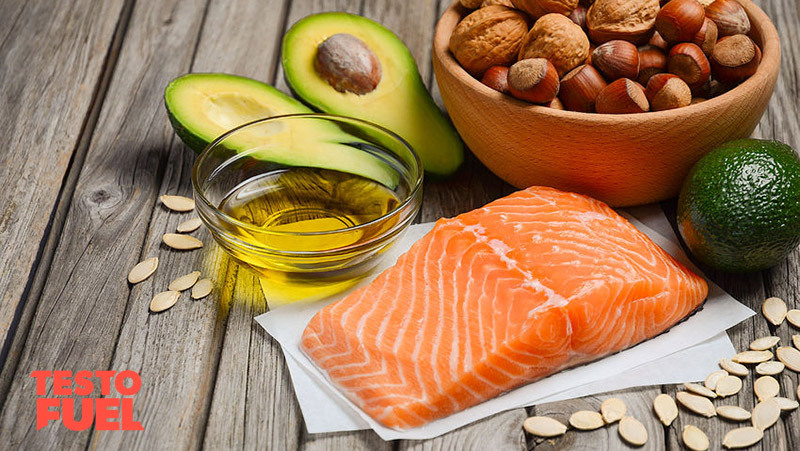 There are different types of dietary fats that can be split into either saturated or unsaturated. Cholesterol, a sterol that helps form testosterone, is a major component of fat-containing foods, and has been shown to improve overall testosterone levels. Subsequent, low fat diets may negatively impact your T levels so make sure you get plenty. Diets that provide less than 20% of total energy from fats have been found to decrease testosterone. Aim for foods that contain plenty of HDLs such olive oil, oily fish as well as nuts or seeds. Just be aware that fat is quite calorie dense so be careful not to let it put you in a calorie surplus that will put weight on as this will lower your T levels.